We’ll put your logo and contact info into any brochure file. Just contact us. 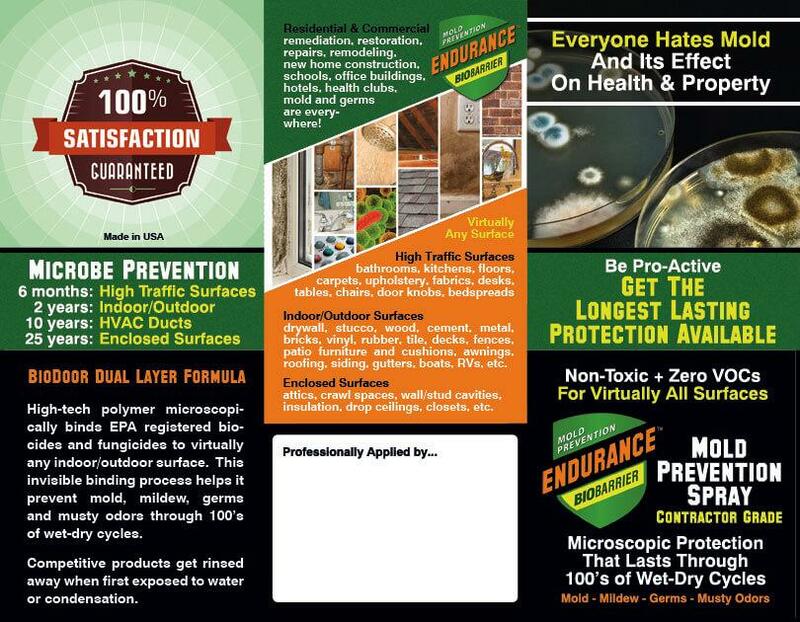 Use these marketing files to help you sell Endurance BioBarrier Mold Prevention Spray as a value-added service. How can customers turn down a chance to pro-actively safeguard their health and property? 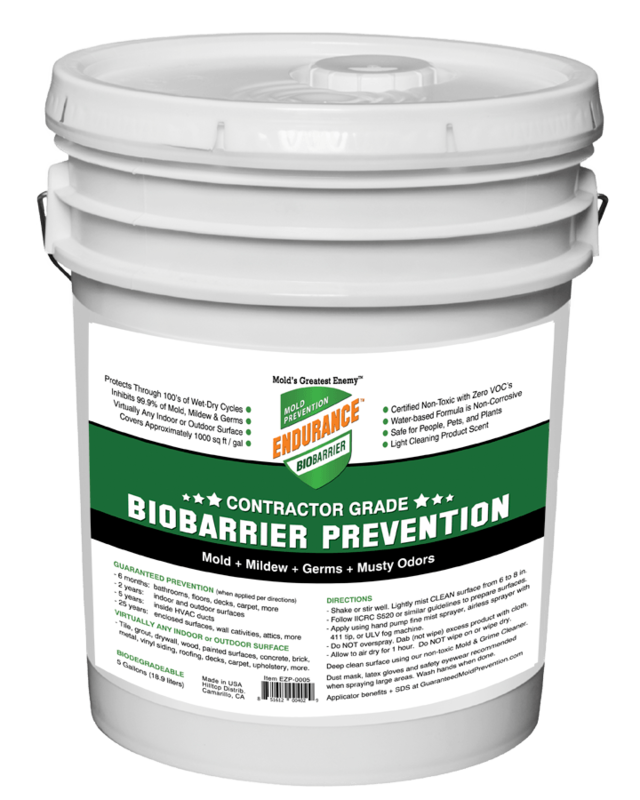 Help your business stand out from competitors by promoting your use of Endurance BioBarrier products. 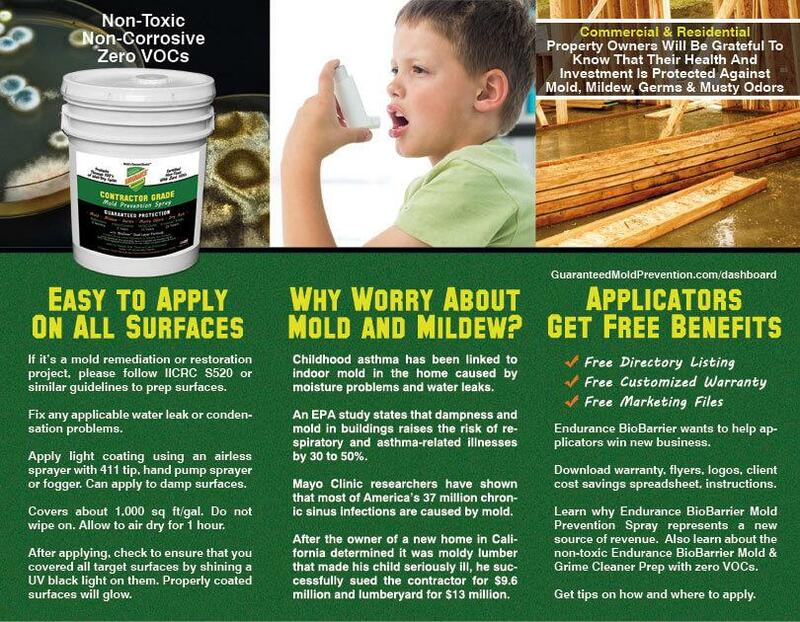 Free directory listing for any business related to mold. Download flyers and brochures. We’ll put your logo and contact info into the files. 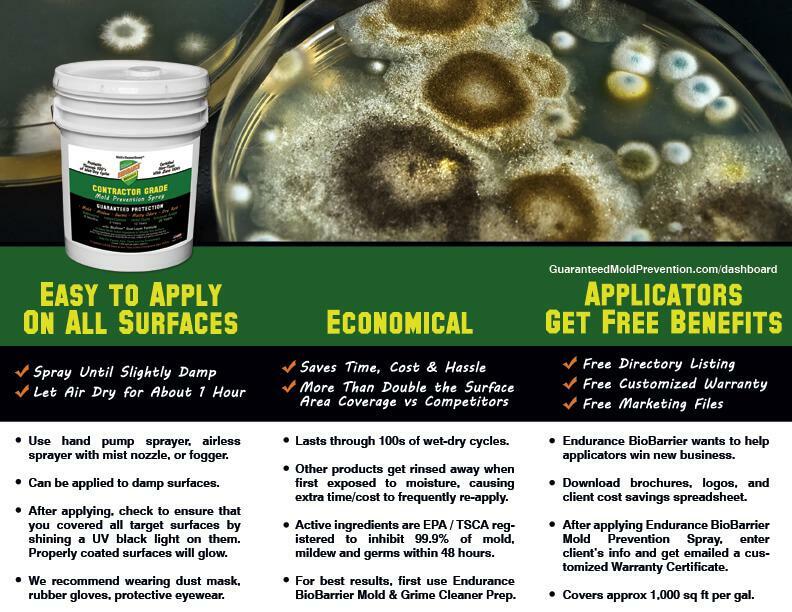 Download spreadsheet that helps you calculate a client’s annualized cost savings by using Endurance BioBarrier Mold Prevention Spray. Free Customized Warranty Certificate displaying applicator, client, and application job details. Years ago the EPA and OSHA stopped recommending the use of bleach for mold remediation. The ionic nature of bleach prevents the chlorine from penetrating porous surfaces such as drywall, wood, grout, and concrete. As a result, bleach does not kill embedded mold roots and spores. Ironically, the water in bleach penetrates porous surfaces, nourishes the roots and spores, and helps mold to quickly regrow. Of course, bleach is also corrosive, toxic, and not good for the environment. Distributors can use the 3 tri-fold flyers or the 8 page brochure to inform their contractor customers about Endurance BioBarrier Mold Prevention Spray. 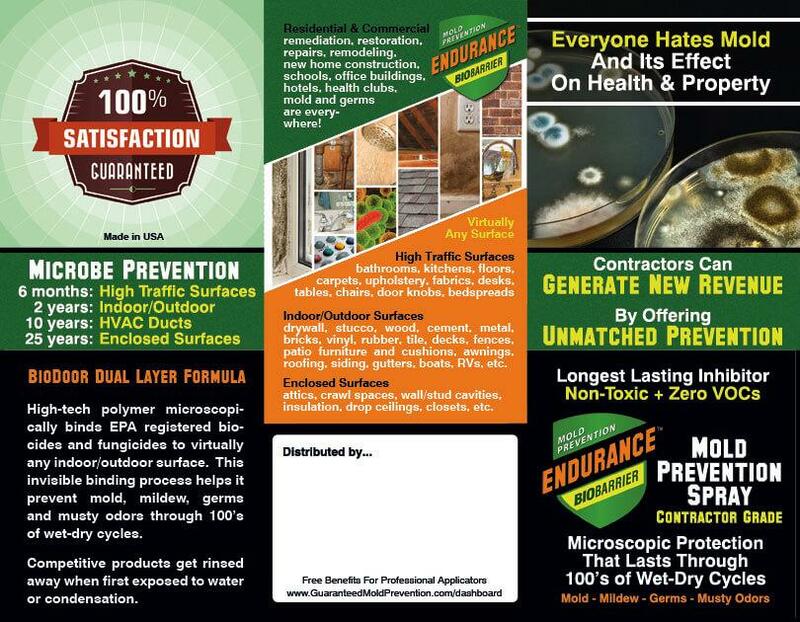 Professional contractors can offer clients this “pro-active microbe prevention” product as a value added service. Therefore, it represents a way to increase revenue on existing jobs and to open the door for getting new jobs. Their customers want results that last. Their customers want guaranteed results. Their customers want non-toxic products. Their customers want the latest technology. View detailed list of our Contractor Grade product features and benefits. Distributors should also consider carrying the Endurance BioBarrier Contractor Grade Mold & Grime Cleaner Prep. 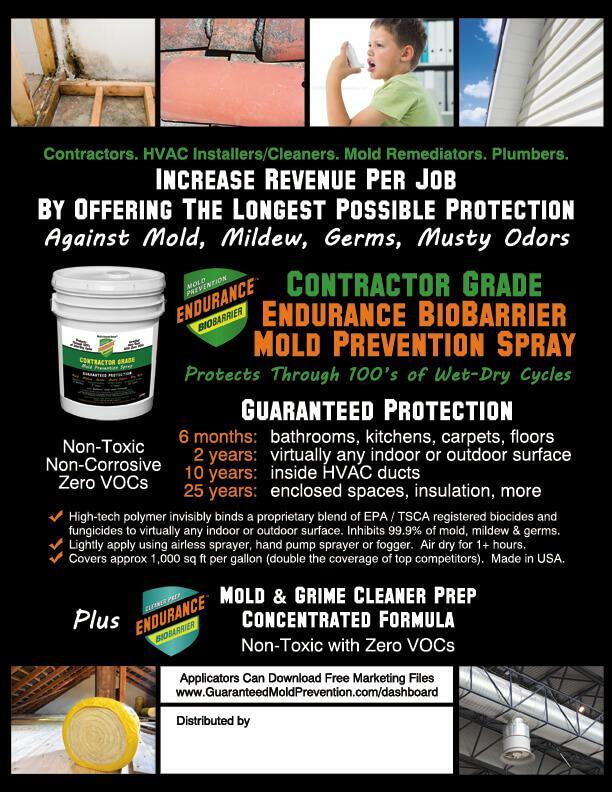 Perfect for deep cleaning moldy and dirty surfaces prior to applying our Mold Prevention Spray. Concentrated formula in 5 gallon or larger containers. Destroys, kills and removes mold and mildew cells and spores. Also easily cleans away dirt, grease, grime and germs. Note: Files for printing include a 1/8 inch bleed zone. Final trimmed print size should be 11.0 x 8.5 inches. 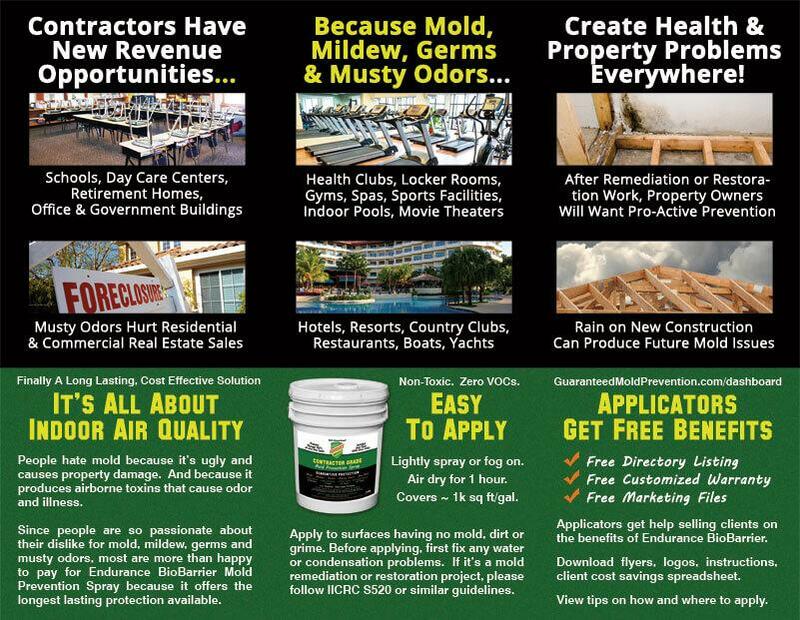 Distributors should send the 8.5 x 11 “New Revenue Source Flyer” to contractors, mold remediation firms, HVAC installers/cleaners, plumbers and other professionals. 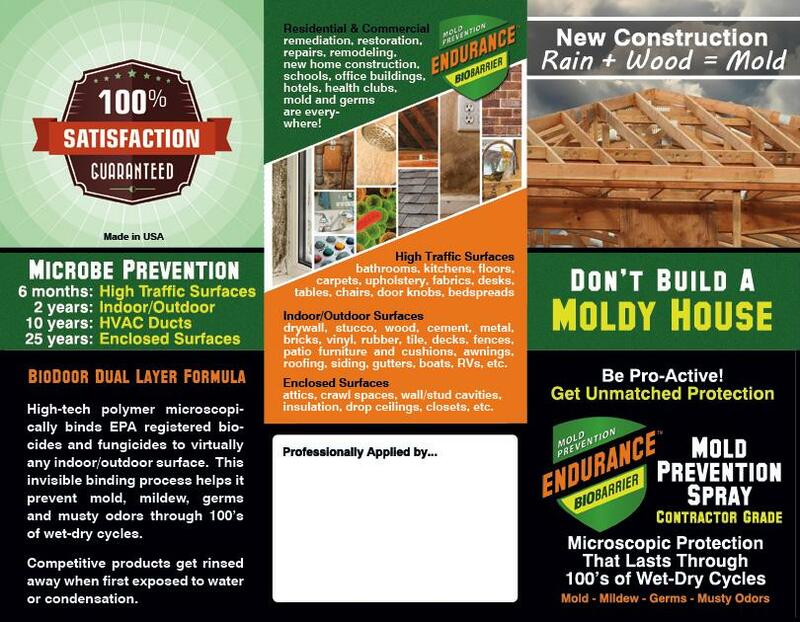 It emphasizes how Endurance BioBarrier’s Mold Prevention Spray represents a way to increase revenue per job. 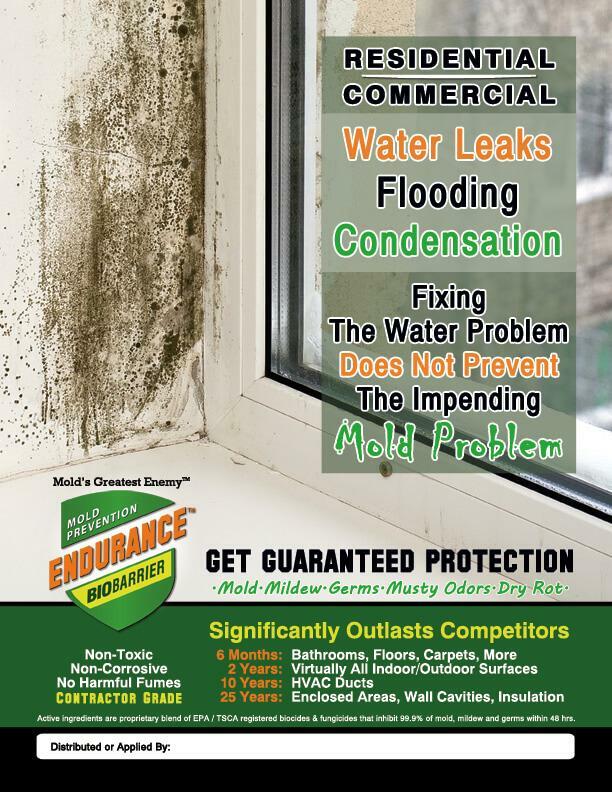 When submitting a quote for job, these professionals should add an estimate for the application of Endurance BioBarrier Mold Prevention Spray. Since their crew will already be on the job site, it takes very little extra time to apply the product. So their margin potential is healthy. And it should also be easy to convince their client to approve this value-added service. 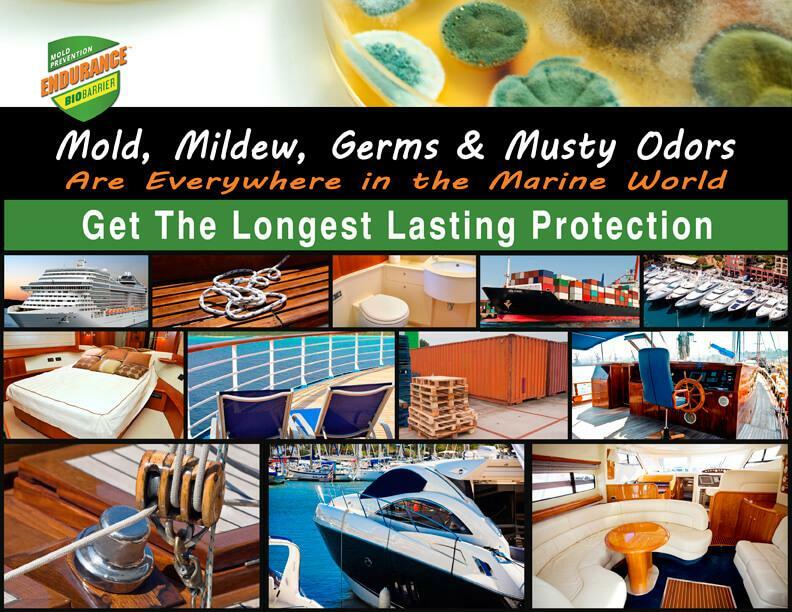 Spending a little extra money gets them the longest lasting protection possible against mold, mildew, germs and musty odors. It is highly likely that in insurance cases the insurance company will cover the client’s cost. The Xactimate code is PNTS+++. 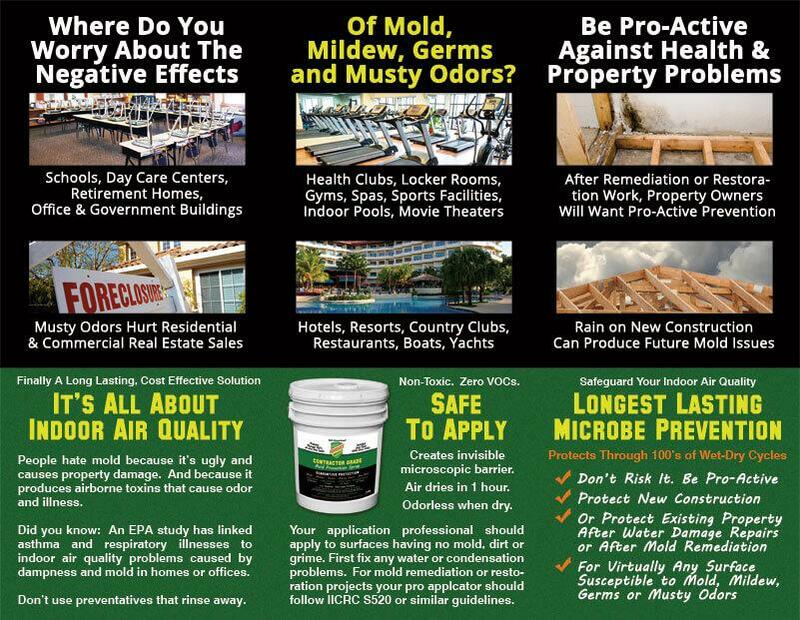 More than ever, people are aware of the negative health issues associated with mold. So they are motivated to protect their IAQ (indoor air quality). People are also demanding the use of non-toxic products that are safe for people, pets, plants and the environment. 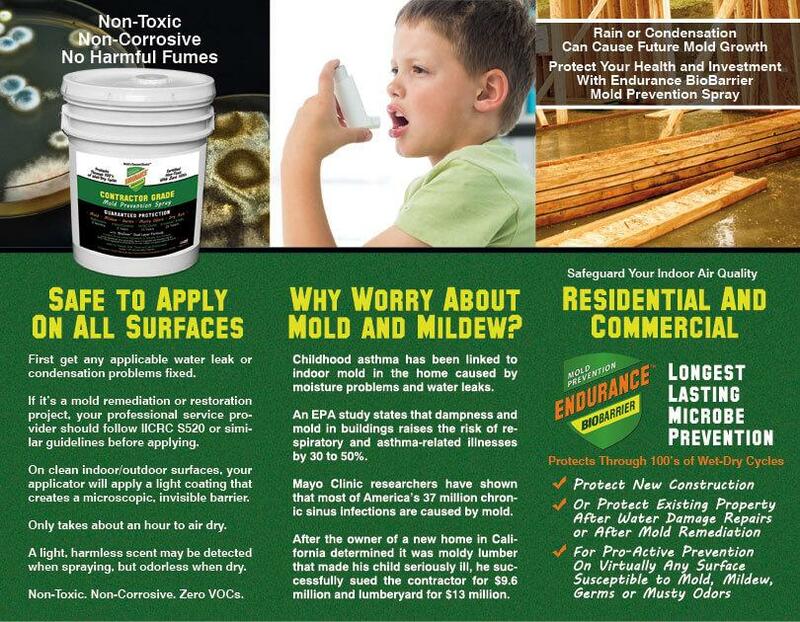 Our Mold Prevention Spray fulfills this demand. 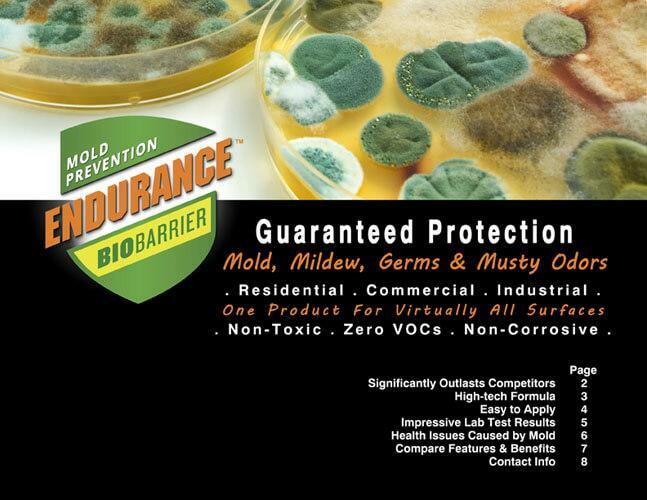 Download a spreadsheet that helps you calculate a client’s annualized cost savings by using Endurance BioBarrier Mold Prevention Spray vs mold products that don’t last. 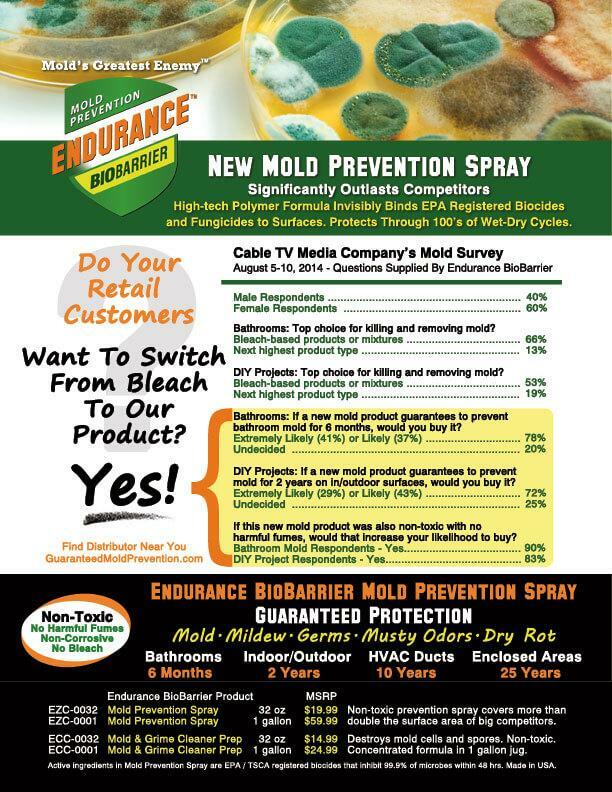 Cable TV “Bathroom Mold” survey indicates an impressive 41% of consumers are “Extremely Likely” to switch from bleach to Endurance BioBarrier Mold Prevention Spray. Hardware stores will get increased category sales because consumers have proven that they are motivated to switch from using cheaper bleach and salt-based products that don’t last and are toxic. 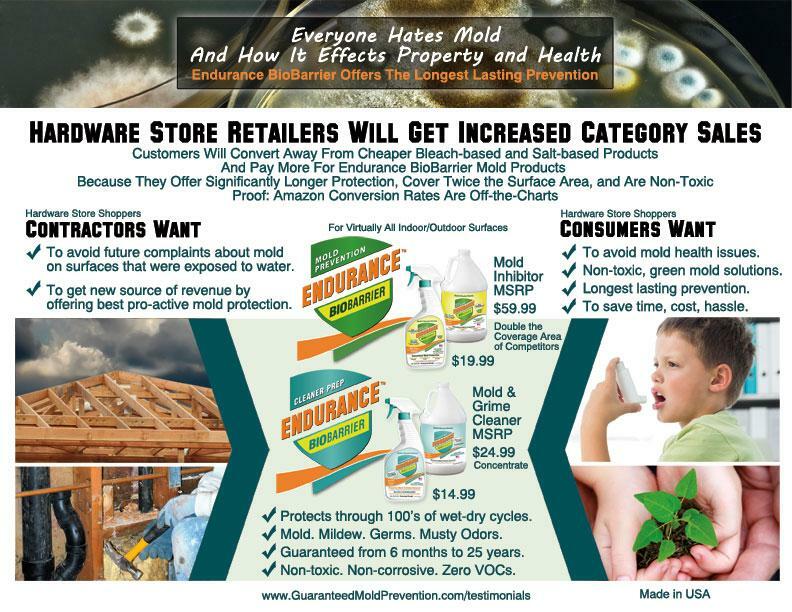 Why should retailers allocate shelf space to our Mold Prevention Spray? 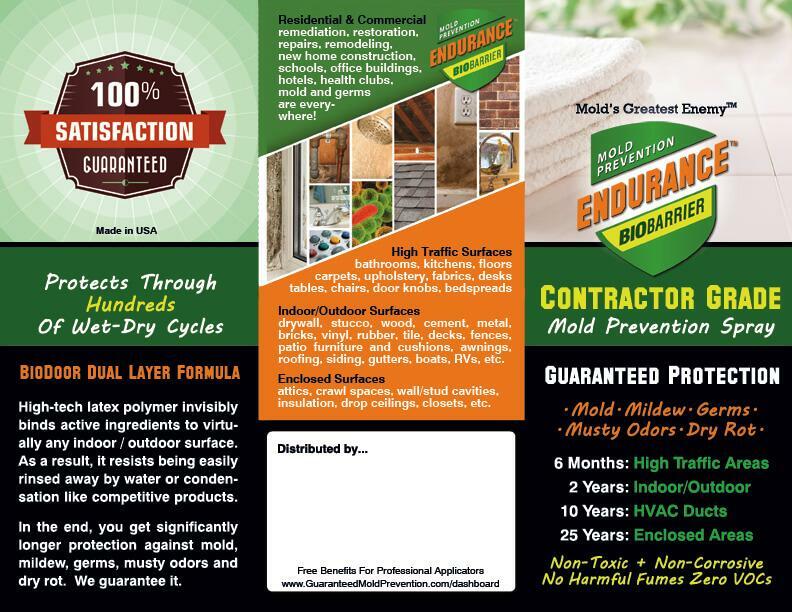 We partnered with a well known Cable TV home improvement channel to survey their viewers about their mold cleaning and prevention preferences. 66% of homeowners use bleach products to fight mold in their bathrooms. HOWEVER, an impressive 41% are “Extremely Likely” to buy a hypothetical new mold prevention product that is guaranteed to significantly outlast their current mold products in preventing re-growth. When asked if they would be more likely to buy the hypothetical new mold prevention product if it was also non-toxic in addition to being longer lasting, 90% said yes! 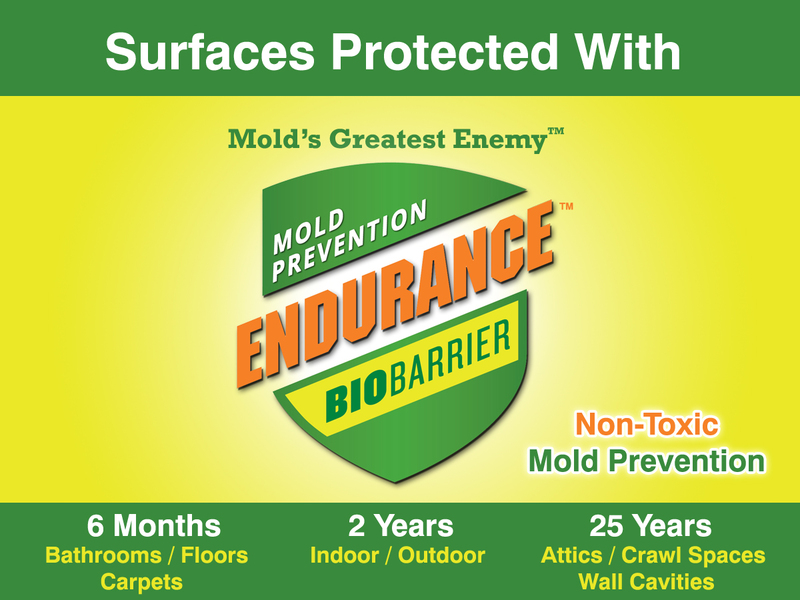 Conclusion: A significant percentage of consumers are highly motivated to switch away from bleach-based products and instead purchase a new mold prevention product with attributes identical to our Endurance BioBarrier Mold Prevention Spray. No competitor can match our long-lasting, non-toxic value propositions. In every month since our products were launched on Amazon in January 2014, the Amazon conversion rates have been off-the-charts at over 4 times the level that is normally considered “great”. This confirms what we discovered in the Cable TV channel survey. Amazon shoppers are clearly motivated by our compelling value propositions despite the fact that they can easily switch and buy one of many less expensive, name brand mold products on Amazon. Our 32oz Mold Prevention Spray and our 32oz Mold & Grime Cleaner both have fantastic reviews on Amazon. Retail store’s shoppers will love our products, too. Years ago the EPA and OSHA stopped recommending the use of bleach-based products for mold remediation. Studies have shown that bleach cannot penetrate and kill mold roots embedded in porous surfaces like grout, drywall and wood. That’s why people need to re-scrub moldy shower grout every 3 or 4 weeks when using bleach. The mold grows back quickly. Of course, bleach is also toxic and corrosive. Consumers are ready for a non-toxic, much longer lasting alternative. By downloading our logo files, you agree not to use them in any way that misrepresents the features, benefits or warranty associated with Endurance BioBarrier products.